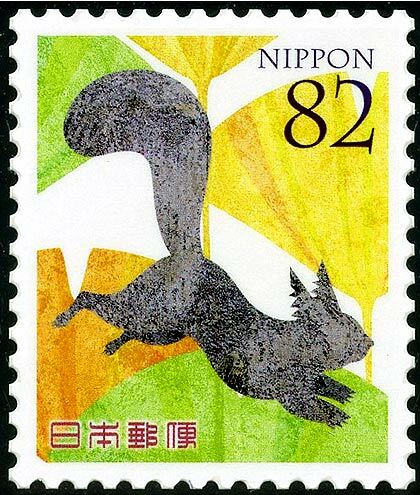 Stamp with Ginkgo leaves design and squirrel. Japan, stamp issued October 3, 2016 (part of stamp sheet "Autumn greetings"). Stamp designer Hoshiyama Ayaka. This stamp is one of many stamps depicting Ginkgo that were sent to me by John Gray, thanks! Many more stamps from different countries on my Art-page. 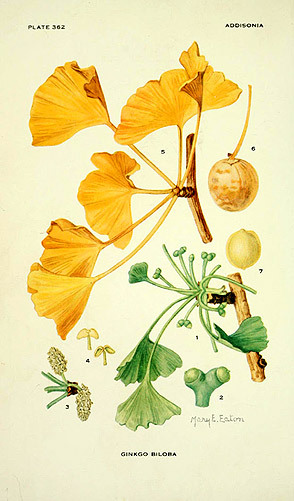 Ginkgo biloba botanical drawing (Plate 362, 1926) by Mary E. Eaton in Addisonia, colored illustrations and popular descriptions of plants, a journal published by the New York Botanical Garden (1916- (1964)).